The following is a review of Just For Him's Treebeard from the Middle Earth Pipeweed Series I did on 2/18/06. 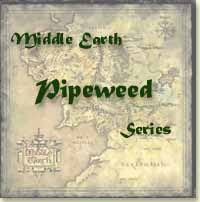 This is the third in the Middle Earth Pipeweed Series! Red Virginias are blended with a rich vanilla to sweeten aroma. Then burleys are blended in to produce a lightly-sweet, nutty, full blend best enjoyed after a long day in the great forests. Treebeard is another special blend from Just For Him. They classify it as aromatic English. This is truly Long-Bottom Leaf with a little more kick. (See my review of LBL). However, not enough kick that I would like but its good for a sweet treat. The sweetness is not overdone and if your looking to try something to satisfy that tobacky sweet tooth you may want to fire some of this up. In the Middle-Earth Pipeweed line I recommend Short-Cut To Mushroom and in the Just For Him blends I recommend Just For Him...if your looking for something with a hint of sweetness. Just For Him blend starts off creamy and rounds off into a delicious nutty euphoria. You can find these at justforhim.com. Call them they will sell by oz.